On Lowell St. opposite Canterbury Street are two large stone columns surmounted with large cement spheres. This gateway is the private access drive to the Caretaker’s Cottage. The “Superintendent's” or “Caretaker's” house is sited to the rear of the Arden estate. 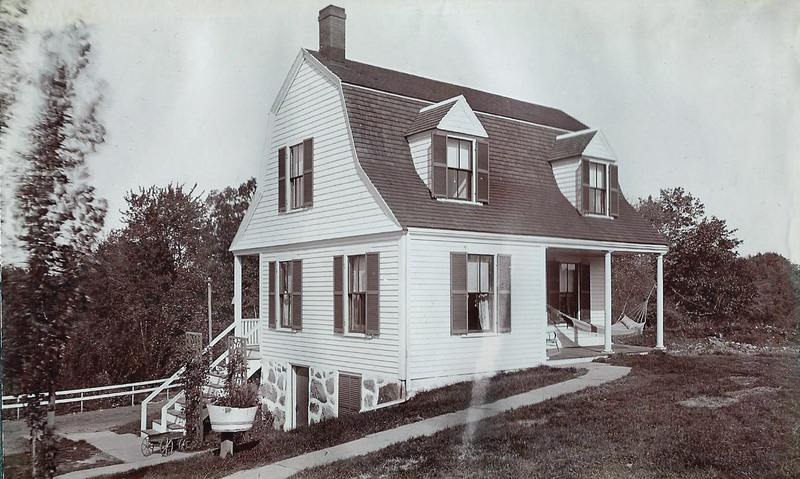 The gambrel roof and gable end facing the front facade is in the popular Shingle Style of the late 19th century. The original house was just a small cottage, the wing to the right in this photograph. The Wood family states that the original house was moved to this spot by William M. Wood from a location nearer the main house of Arden. In 1899 and 1900 Mr. Wood began the process of transforming the former John Dove estate. Andover Townsman April 6, 1900 pg. 1 - This week will very nearly bring to an end the work of alterations and repairs which have been in progress at William M. Wood’s estate under the charge of contractor E. W. Pitman. Among the buildings which have been re-located are the barn, summer house and gardener’s house. The west wing may be the summer house that was moved to this location. 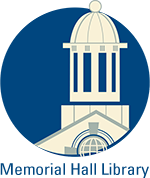 The larger addition was added by 1906 as the current structure is drawn out on the Andover 1906 map. The 1900 Andover Valuation schedule lists the farm house on the estate at $900. In 1910 the Arden property is listed under Mrs. Ellen A. Wood and the farm house is valued at $1500. The valuation increased again to $1800 in 1920. Mr. Wood built an extensive farm containing several barns, poultry houses, a creamery building and several sheds. A full time caretaker and foreman was a necessity to oversee the daily operation of the “Arden Farm” and estate. The 1897 Andover Directory list August Fredrickson as farmer on the Wood estate. Federal census 1900 August Fredrickson, born May 21, 1873 in Engleholm, Sweden age 27 is the farm foreman. His address is 276r North Main Street on the Arden estate. August is the son of Frederick Pearson and sailed to America in 1889. He became a naturalized citizen on Nov. 18, 1896 in the Lawrence, Courts. His wife of nine years Helma (Lynn) Frederickson age 25 was born June 1874 in Sweden and immigrated in 1890. They had two children Carl H. b. May 1893 age 7 and Harvey (Avard) age 4, b. Oct. 1895. A third son Helmer H. b. 1894 died in 1895. The Wood family states that Frederickson occupied this house during most of his employment with William M. Wood. However in 1910 August and family are living at 24 Crosby St. in Lawrence and he gives his occupation as Wagon Driver for a Worsted Mill. He returned to Arden and is listed on Poor St. in 1920 next to the Wood’s son Cornelius A. Wood who lived in “Lake House”. No street numbers are given and this may have been how they enumerated the Caretaker’s house on the estate. August’s occupation is Caretaker of the House. Frederickson’s family had increased by five; Ralph, b. 1905, Hazel, b. 1907, Esta b. 1911, Anna M., b. 1914 and Ida born in 1916. Another daughter Mildred would be born in 1920. The increase in size of Fredrickson’s family may be the reason the house was enlarged by Mr. Wood. August was a trusted employee of William M. Wood. He traveled with Wood as his valet on a European tour which included Sweden and Norway leaving New York on the S.S. Olympic in March 27, 1925. August was also with Mr. Wood in Daytona, Florida along with Wood’s chauffeur Joseph Beaulieu when Wood died on February 2, 1926. August’s wife Helma died the following February 21, 1927 at the age of 52. August died the following year on September 29, 1928 at age 55 from an apparent heart failure. He has found at the bottom of the stairs at his house. Both are interred at West Parish Cemetery, Andover, MA. His daughter Hazel now 18 assumed the role of Head of the household and moved her three sisters, Esta age 16, Ida 12 and Mildred 7 to 2 Arundle Street. In 1930 Hazel is a brush maker at the Hardy Brush Co. and Esta is a heal maker in a shoe shop. The Caretaker’s house had been rented out by 1930 to Julius and Alice H. Rockwell. Rockwell was a salesman and co-owner of a card clothing co. on Buxton Court in Andover. The Rockwells had three sons, Julius Jr., William H. and Francis W. “Frank” all who served during WWII. In 1943 the address had been changed to 56 Lowell Street and renumbered again by 1949 to #52. The Rockwells remained here until 1969. From 1971 Kenneth M. & Grace H. Taylor rented the house. Taylor was a manufacturer who had moved from Roanoke, VA. Taylors remained until 1975-76. The house remained vacant for several years thereafter. In 2012 Mrs. Rosalyn Wood had the house completely remodeled inside and out. The work and design were done by Tom Childs of Andover. 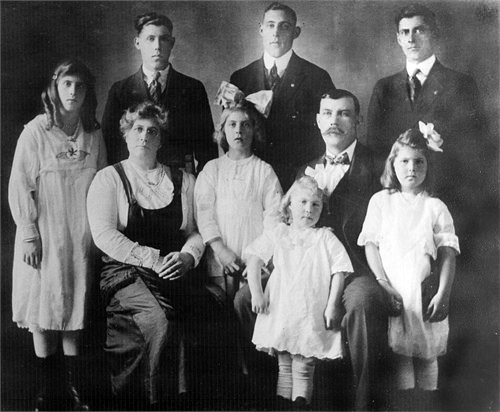 Daughter Mildred was born in Sept. 2, 1920 after this family portrait was taken. 3. Helmer H. Fredrickson b. Sept. 23, 1894 in Andover died June 19, 1895 age 8m 26d of Measles. Interred at Bellevue Cemetery, Lawrence, MA. 4. Ralph William Fredrickson b. 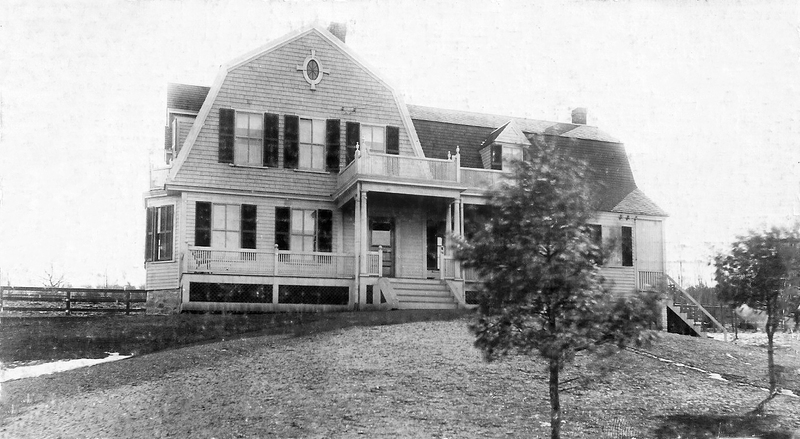 March 10, 1905 at 159 Garden St., Lawrence, MA, married on Nov. 1, 1925 age 21 in Nashua, NH to Gertrude Caffrey, age 25, 2nd marriage b. Leomenster, MA, daughter of George & Lillian (Eabert) Wonderly. 1940 census Ralph is an automobile mechanic for the Gas & Electric Co. Three children listed; Daniel A. Caffrey 22 step son laborer in Worsted mill, Edna A. Caffrey 20, step dau. heel breaster in wood heel shop and Shirley L. Fredrickson age 11 daughter. Ralph died July 28, 1971 in Lee, FL.